It’s carnival time in Italy and with it comes the promise merrymaking aided by good food, crazy costumes, spooky masks, spectacular processions of floats and handfuls of flying confetti. Carol King selects what promise to be the best carnivals to visit. Situated on the foothills of Mount Etna, and with views of the turquoise waters of the Ionian Sea, the Baroque town of Acireale hosts the best carnival in Sicily. Acireale hosted its first carnival festivities in the 18th century, so it has experience in putting on a great show including a procession of huge floats made from papier-mâché and flowers. In keeping with the Italian tradition, the allegorical floats satirise those in power, caricaturing the newsworthy politicians and celebrities of the moment. People used to throw eggs or vegetables at each other during carnival celebrations; today they have been replaced by paper confetti and spray foam, so expect to be pelted with something at some point and it’s best to join in to have some fun. Participants sport masks, wild hats and costumes, so there’s a great atmosphere as well as the overriding feeling that locals are eager to keep a centuries-old tradition alive. Carnival began in the small village of Bagolino near Lake Idro in the 16th century. The festivities fall into two parts. First, the balarì (dancers), dressed in red hats, embroidered jackets, knee breeches, white stockings, white shirts, black ties and silk shawls dance below the homes of friends and family. Then the mascher (masked figures) dressed as old men and women make silly jokes in falsetto voices to the crowd. The origins of the mascher arose from a traditional courtship ritual rich in symbolism. Fêted as the most extravagant carnival in Europe, the Cento carnival is known for its stylish allegorical papier-mâché floats, beautiful costumes and riotous fun. It’s become so renowned that the Cento carnival is twinned with the famous carnival held in Rio de Janeiro, Brazil. Each year, Cento’s floats feature in the Rio parade and they are the only foreign floats to take part in the legendary Night of Champions. In return, each Sunday during carnival, Brazilian musicians and dancers join in the celebrations at Cento. This year’s carnival is particularly important to the locals and to the region because Cento was damaged by an earthquake in May 2012 and the event is seen as an opportunity to return to happier times. Ivrea is home to Italy’s oldest carnival. The festival opens to the sound of music from traditional pipe-and-drum bands. The event starts what is a re-enactment of the city’s liberation from tyranny in medieval times. A baron starved the city but was driven away thanks to a miller’s daughter, who roused the people to revolt. The heroine of the carnival is the mugnaia (miller’s daughter), who is joined by a general accompanied by his staff consisting of officers on horseback. 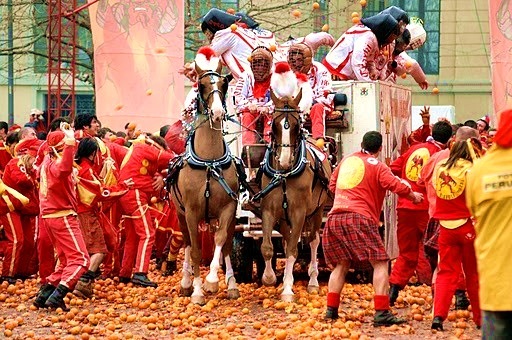 The most spectacular event of the festivities is the Battle of the Oranges held on 12 February, during which people pelt oranges at the feudal lord’s army, who in turn throw oranges from horse-drawn carts. From the Thursday before Lent, townspeople and visitors who take to the streets wear the berretto frigio (Phrygian cap), which is a red conical hat that shows their support for revolt and aspiration to freedom, just like the heroes of the French Revolution. 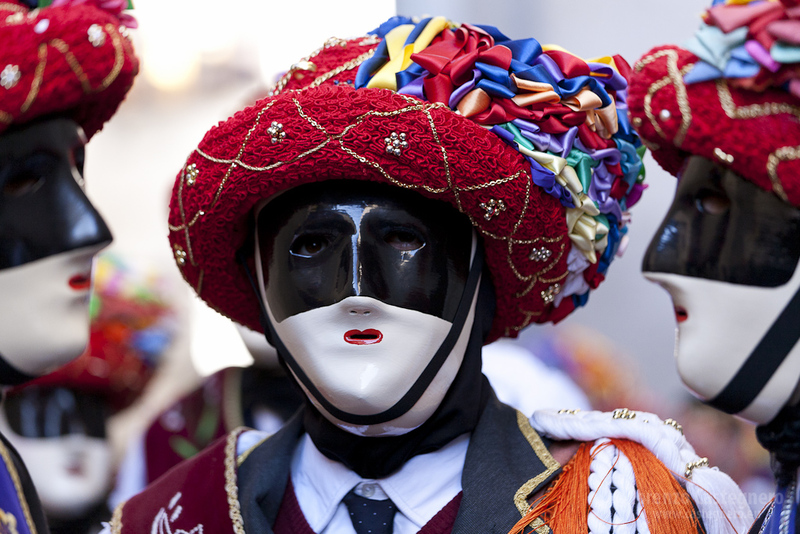 Situated south of Bari, the town of Putignano hosts one of the oldest carnivals in Europe, dating to 1394. 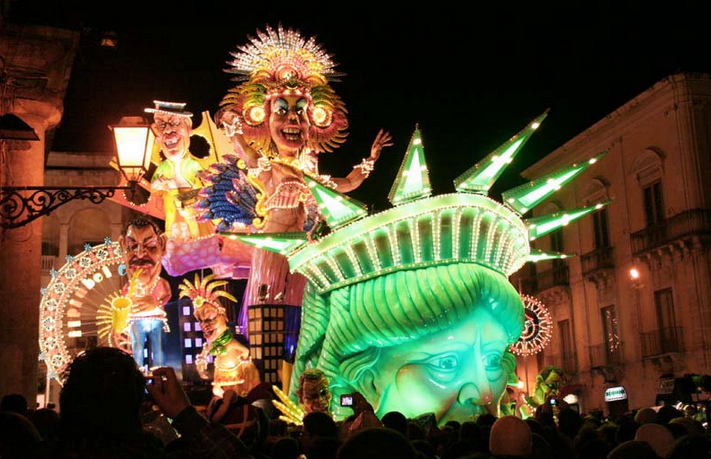 It is one of the most important carnivals in southern Italy. Allegorical floats, people wearing traditional costumes and masks, dancing, food and wine greet visitors during carnival. The official carnival mask is green and white. The mask is named ‘Farinella’, named after a local dish made from a fine flour consisting of chickpeas and toasted barley. Carnival began in the Middle Ages in Rome, but celebrations reached their height after the election of Pope Paul II and the transfer of the papal residence from Palazzo Venezia to the historical centre. Today, most of the carnival celebrations in the Italian capital take place in the Piazza del Popolo and Piazza Navona. 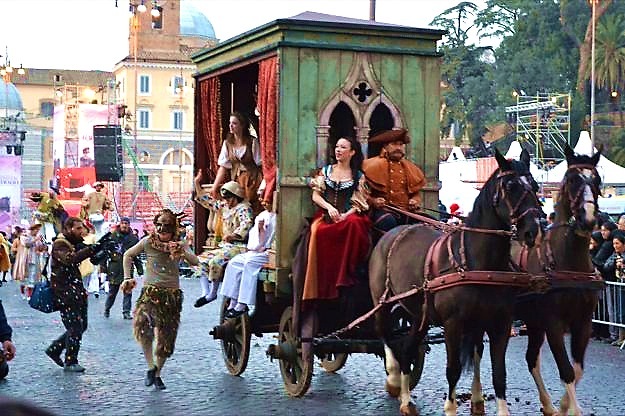 Carnival goers in Rome will get to see firework displays, street artists, equestrian tournaments including jousting, commedia dell’arte performances, and parades featuring floats and masked participants, as well as a range of equestrian-themed art shows staged to coincide with the event. The highlight is the horse race on Via del Corso on 2 February, in which 100 Berber horses compete. The race is the biggest equestrian event in Europe and attracted 800,000 spectators in 2012. This year, there is also a parade dedicated to the Romantic composer Giuseppe Verdi to mark the 200th anniversary of his birth. The parade consists of horses and carts driven by people in traditional costumes, who will be joined by members of the Italian cavalry and street artists. The town of Tricarico is home to one of the best-preserved medieval historical centres in Lucania, which provides a magical setting for carnival celebrations. Yet what makes carnival in Tricarico unique is the strange costumes the locals wear. Masked participants dress as cattle and carry cowbells: those representing cows dress in a white costume with rainbow-coloured ribbons, while those pretending to be bulls dress in a black outfit with red ribbons. Experiencing carnival in the Aosta Valley is special because it offers the chance to join in festivities in Alpine surroundings. The famous carnivals in the Aosta Valley are the Carnevale di Verrès and the Carnevale di Pont-Saint-Martin. The Carnevale della Coumba Freida – ‘Coumba Freida means ‘cold valley’ – is held in the villages of the Valle del Gran San Bernardo: Ollomont, Valpelline, Allein, Etroubles, Gignod, Saint Oyen, Bionaz, Doues, Saint-Rhémy-en-Bosses and Roisan. 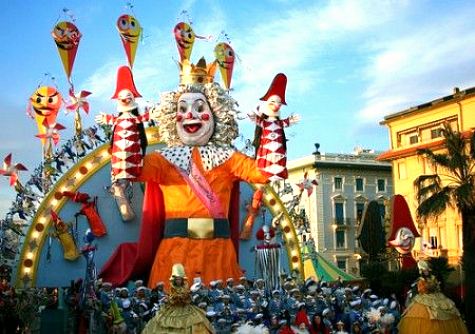 The carnival in the seaside town of Viareggio is the most flamboyant in Italy. Its party atmosphere and processions of allegorical papier-mâché floats regularly attract a million spectators. Masked parades take place along the Liberty-style boulevards on 3, 10, 12, 17 and 24 February. Every evening, there are carnival celebrations in bars, bars, restaurants, and nightclubs throughout the city, and many of the hotels along the Riviera della Versilia (Versilian Riviera) host all-night masked carnival parties. 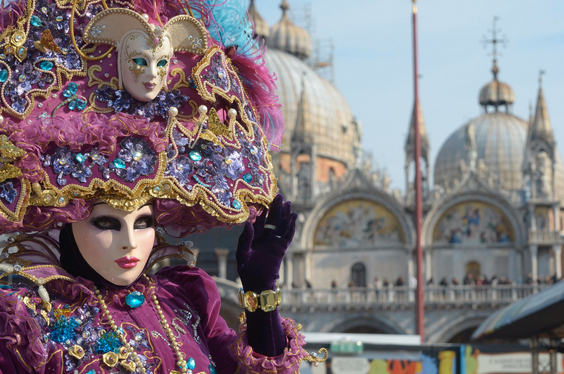 During the world’s most famous masked party, every corner of Venice becomes a multi-coloured series of shows, parades, music and masks. St Mark’s Square is at the heart of the party and hosts traditional events such as ‘Festa delle Marie’ (Festival of the Marys). Held on 2 February, the festival re-enacts the homage the Venetian Doge made every year to 12 beautiful but humble Venetian girls, by offering them magnificent jewels as a bridal dowry. The festival involves 12 girls dressed in period costume parading from San Pietro di Castello along the Riva degli Schiavoni to reach St Mark’s Square, where they will receive a warm welcome from the awaiting crowd. For those who want to immerse themselves in La Serenissima’s festive history, Palaces throughout the city host grand masked balls. On 12 February, the carnival closes with the spectacular ‘Vogata del Silenzio (Silent Water Parade) in which a traditional rowing boats and gondolas sail along the Grand Canal, from Rialto to San Marco, lit only by candlelight.